Organisms are built in a way so that form and function are both related and indicitive or lifestlye and ability. The same is true for Maiasaura peeblesorum. By studying their skeletal structures we can make inferences into their form and functions. During the early and late nestling period, growth would have occured exceptionally fast. These stages would have lasted for a one to two month period, during which the bone would have been characterized as being spongy and consisting of large vascular canals (Horner et.al., 2000). When Maiasaura reached their early and late juvenile stage, they would have reached around 3.5 meters, or eleven feet in length. The growth during these stages would have taken around one to two years. During late juvenile and into their sub-adult phase, bone would have become either compact or differentiated into fibro lamellar tissue (Horner et.al., 2000). Fibro lamellar tissue was a dominant tissue in many long bones of Sauropod dinosaurs. It is believed that fibro lamellar tissue was what allowed these organisms to reach gigantic size (Sanders et.al., 2014). Finally, the sub-adult and adult phase would be reached after six to eight years, when Maiasaura would have been seven to nine meters long, or twenty-one to twenty-seven feet. At this time lines of arrested growth (LAGs) appeared regularly throughout the bone. This appearance of regular LAGs provide support that Maiasaura was characterized by high growth rates at young ages and eventually slowed until their adult phase, where a lamellar-zonal structure indicated the end of the growth process (Horner et.al., 2000). Maiasaura’s skeleton can go even further to help us further understand how Maiasaura communicated. The anterior premaxillary foramina, better known as the small cranial bones in the upper jaw, allowed for what is believed to have been vocalization and olfactory senses, or smell (Horner 1983). 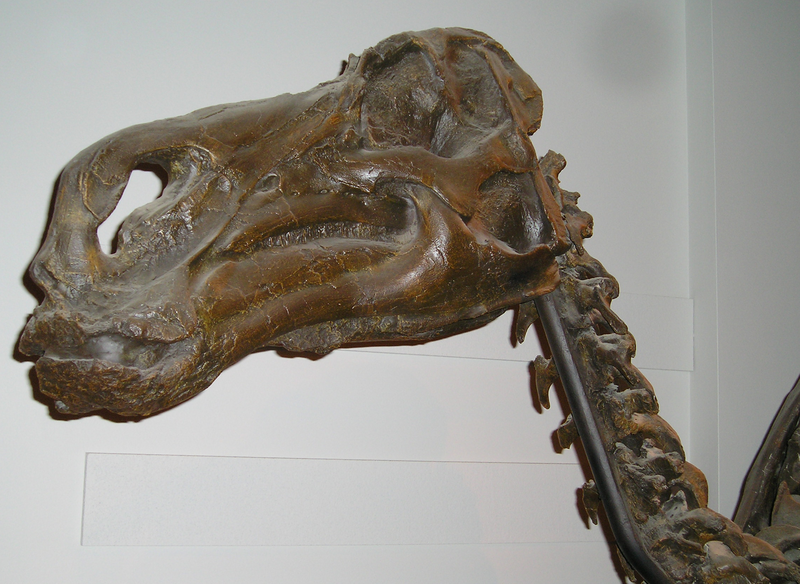 Their faces were also characterized by elongated facial regions and small nostrils (Horner 1983). These skeletons also give us an informational insight into the functions of these organisms and how they changed over time. 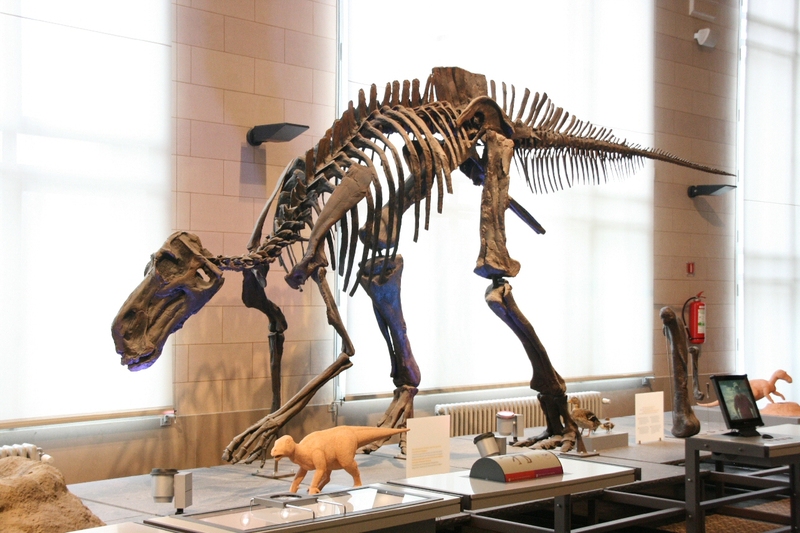 By studying the increase in muscle size and bone size as they aged, specifically postural muscles and lever arms of protractor muscles in the humorous, there is physical evidence that Maiasaura exhibited a change from bipedalism to quadrupedalism (Dilkes 2001). This change was believed to be due to behavioral changes rather than a response to form, since the growth of these muscles and bone lessened the likelihood of collapse as these organisms grew to extreme sizes (Dilkes 2001). Continue to interactions to learn about how Maiasaura lived with each other and more about their lives.